On Saturday, February 11, an outstanding team of Central Brooklyn parent leaders affiliated with the Adelaide Sanford Institute’s (ASI) Parent Leadership Institute and supported by the Campaign for Educational Equity (CEE), outlined New York students’ educational rights and presented their own rights-focused legislative requests at a well-attended breakfast with city and state elected officials, parent leaders and their children, and local civic leaders. Please read our “Movement-Building” backstory and then the legislative-breakfast reflection by Earline and Priscilla Mensah, a dynamic Parent Leadership Institute mother-daughter duo. In May 2015, CEE’s Know Your Educational Rights public-engagement and research team launched a partnership with the ASI’s Parent Leadership Institute to facilitate monthly Saturday-morning educational-rights workshops, which ultimately informed over 100 parent leaders about students’ resource-related rights under New York State law. Some participants, curious about the levels of opportunity available to their children, began using our research tools to assess and report back on the availability of basic resources in their schools. The parents also benefited from candid school-resource-related conversations with a number of master educators. 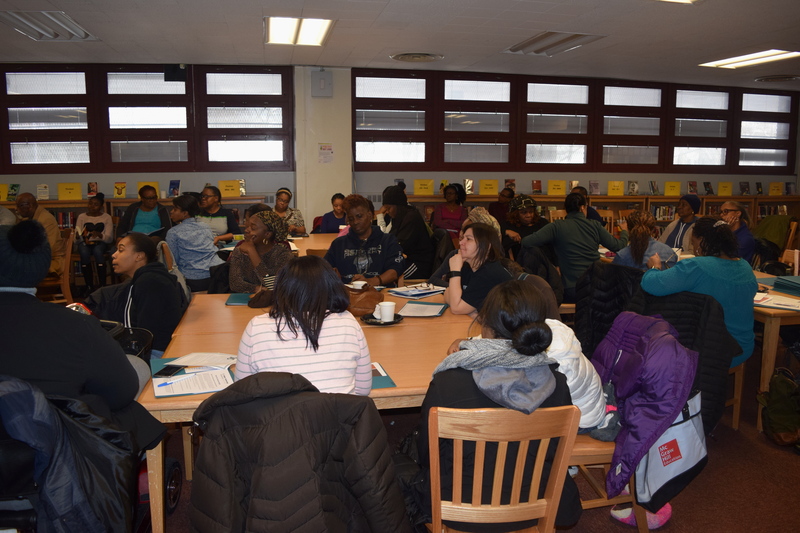 In September 2016, a smaller group of those parent leaders, known as the “Know Your Educational Rights Parent Ambassadors,” kicked off a months-long campaign to share their new knowledge at important forums throughout Central Brooklyn, including the public meetings of several Community Education Councils, Community Board education committees, parent associations, and the Brooklyn Borough High School Presidents Council. Inspired by the Parent Ambassadors’ powerful leadership, and grateful for the valuable new information, parents and other community members around Brooklyn and throughout NYC have begun to call upon state and local elected and education officials to inform all families about students’ educational rights by September 2017. 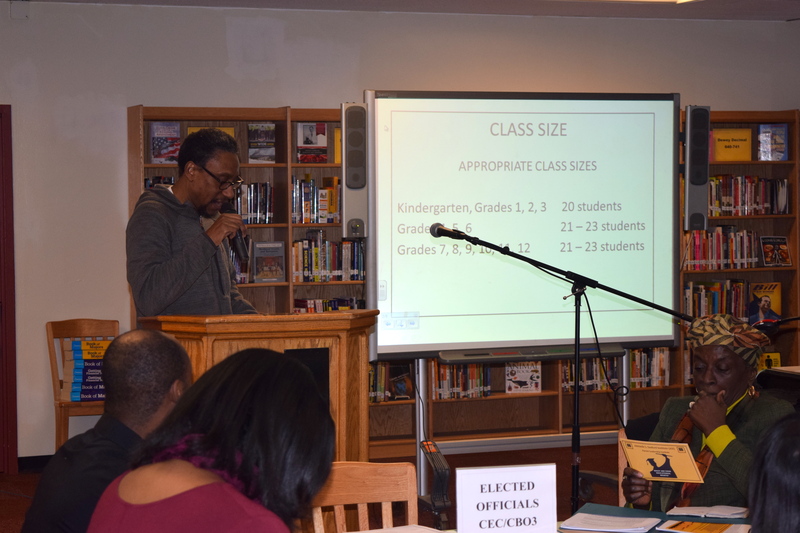 “BBCCSSSE” is what you heard dozens of parents and elected officials chanting in the library of Bedford Stuyvesant’s very own Boys and Girls High School this past Saturday. This is because, on Saturday February 11, 2017, the Adelaide Sanford Institute hosted its annual legislative breakfast featuring elected officials and other members of the community, such as parents and educators. One of the main themes of the program involved Dr. Renee Young teaching the audience members the “BBCCSSSE” chant, which stands for New York students’ fundamental resource-related rights under the state constitution: “books” (and other instructional materials, supplies, and technology), “buildings” (facilities), [appropriate] “class size,” [suitable and up-to-date] “curricula,” “services” (for students struggling academically), “safe [and orderly] environment,” “smart” (qualified educators and other school personnel), and services for English Language Learners and students with disabilities. In attendance were Assembly Members Latrice Monique Walker and Annette Robinson (retired), Council Members Inez Barron and Al Vann (retired), and State Senators Roxanne Persaud and Kevin Parker. Parents were given the opportunity to voice their demands—to inform all parents of students’ rights by this fall and to create a network of Central Brooklyn parent resource centers—and concerns to the elected officials. Other notables included NAACP Brooklyn Chapter president L. Joy Williams; Director of the Adelaide Sanford Institute Dr. Christopher Smith; two of the hosts of the forum, Drs. Renee and Lester Young, the former of whom leads ASI’s Parent Leadership Institute and the latter of whom serves as ASI’s board chair and on the New York State Board of Regents; and Joe Rogers, Jr., of the Campaign for Educational Equity at Teachers College, Columbia University.